This is the best hat I’ve seen all season. 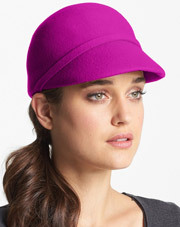 How can a haute baseball cap with crisp lines and equestrian vibe not make you smile. This will go with everything in your closet, from the most casual to the most dressy outfits, and sporty short jackets to super polished midi-length coats.